I am from snow pants and toboggans, from stacks of library books and homemade mac ‘n cheese. I am from the big house on the corner, filled to the brim with friends and strangers and children always underfoot. I am from crab apple trees and lilac bushes. I am from a red metal swing set and forts in the basement. I am the brave hero and beautiful princess and brilliant police dog from thousands of adventures. I am from Anne Shirley, and Laura Ingalls, and Caddie Woodlawn. I am from camping trips and bike rides, from going for a drive, with no particular destination in mind. I am from Bill and Barb and the Robson girls. I am from eating ice cream year round and reading into the night. I am from “life isn’t fair” and “God is in charge” and “The Old Rugged Cross.” I am from napping in a slip between morning church and evening service. I am from eating the crusts after the Breaking of Bread and stealing sugar cubes in the foyer. I am from Pioneer Girls and Awana and Youth Group. I’m from The Meeting, from the Chapel, from full-time ministry, from questions and wrestling and finding my own way to love Jesus. I am from Calgary and Scotland, roast beef and apple pie. From the old country, from a farm on the prairies, from stories of William Wallace. I am from Los Angeles, from avocado and orange trees, from cousins down the street. I am from family friends and Three Day Meetings, from a man who fell in love with his friend’s little sister, from a 19-year-old woman who moved across the continent for him. I am from slide shows of family trips, from playing in the attic, from progressive Christmas dinners. I am from the blue Porsche in the garage, built before I was born. I am from walks around the reservoir and climbing the big “H”, from Stampede breakfasts and cowboy hats. I am from biting my tongue and being the better person. I am from laughing and eating and endless small talk. I am from people who always have room for more, who always have more to give. Taking part of the I Am From synchro-blog at She Loves Magazine. You don’t have to be a writer, just follow the template and write your own version of George Ella Lyon’s poem. It’s worth doing. Another Friday. Another Five Minutes to write. Another topic. We all need it. We all crave it. We all spend a lifetime looking for it. Maybe it’s a house. Or an apartment. Or a webpage. Or a shopping cart. Or a fort cobbled together with plywood and packing tape. Or a fuzzy blanket, worn out in all the right spots. We call it home, because it is ours. It feels safe and comfortable. It is relief when everything spins out of control. Whether it was a gift or a hard-fought victory, we have carved a place out of the world where we belong. And somewhere along the way it becomes less about where we are, or who we’re with, or what we have. It becomes a part of us. One day when it is long gone and strangers have moved in and time has eaten away the threads of it, it remains as real to us as ever. I am the big, blue house on the corner. I am bowls of ice cream with Dad. I am stirring the gravy while Mom zips around the kitchen. 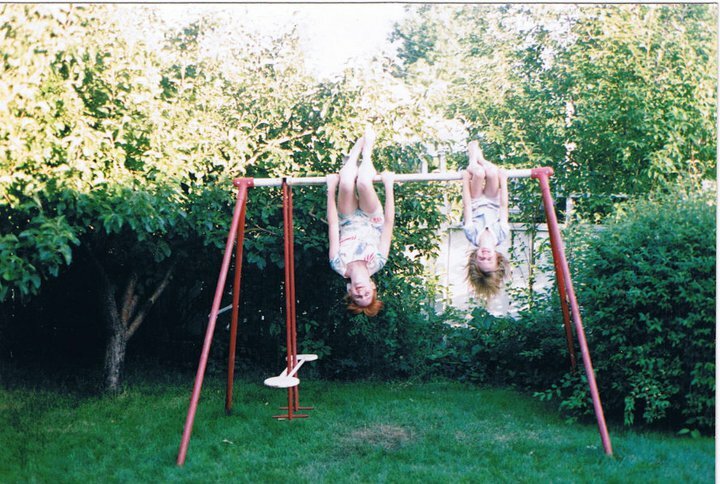 I am a red swing set and crabapple trees and little sisters tagging along after me. I am the third unit in Student Family Housing. I am a fifth generation ratty old couch with a green sheet overtop. I am goofing around in the tiny kitchen, making orange sauce and noodles because we can’t afford meat. I am ducking to get into the bathroom in a tiny basement suite in Guelph. I am the mural of a park in my daughter’s first room. I am picking blackberries over the fence. I am counting the 14 stairs up to the living room with my son. I am so many places and people and things which make me feel safe and comfortable and loved. Because we never really leave home. We carry it with us. Always. So here’s me, craving ice cream with my Dad and orange sauce with noodles. I don’t think I appreciated them as much as I should, at the time. (and pork chops, if you can afford it). 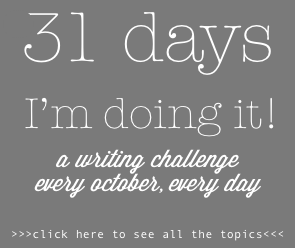 Join Lisa-Jo for a 5 Minute Writing Challenge: set your timer, clear your head, for five minutes of free writing without worrying about getting it right.